Zombie Wine Has Livelier Labels! Fans of Robert Kirkman’s best-selling comic series and/or it’s TV counterpart, take note: The Walking Dead Wine might be your new House Red. The Last Wine Company has introduced two blood-red libations, a Cabernet Sauvignon and a field blend known as The Walking Dead Blood Red. They weigh in at a not-unaffordable $18.99 from most retailers. And as if the cherry and oak aromatics weren’t already enough to make you do a Zombie Happy Dance, these bottles have something a little extra. No, it is not Brains. The labels are interactive! Whee! They respond to the Living Wine Labels app, an augmented reality innovation that brings labels to life. If you download the Living Wine Labels app from the Apple App Store or Google Play Store, you can launch it, point it at these bottles, and get treated to some cool revenant hijinks. The Blood Red Blend features an image of Sheriff Rick Grimes staring down the undead. When the app is pointed at the label, Sheriff Rick fights off the “walkers” in the wine aisle. 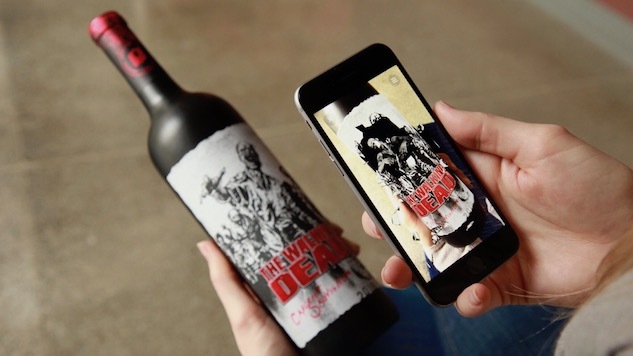 The Walking Dead Cabernet Sauvignon label features a horde of zombies who will break out of the label onto the phone screen. Pointing at both labels side by side triggers the characters to fight each other. Oh, and the corks are collectible, featuring a variety of images such as barbed wire, a walker hand and an undead head. So now the undead are officially the most lively folks in the wine aisle.